Description: 300mm White End Caps For Bullnose Window Boards. Sold In Pairs / x2. .. Window Cill Sqaure End Cap - Double Ended so it can be cut and used for both sides if necessary. 300mm or 30cm long. Fits the thin 3mm Window Cill/Sill Cover Board. .. Thin internal Cover Cill 3mm x 245mm x 5.0m The L-Shaped lip Cill is an extremely versatile product suitable for use both inside and out. Use this board to cover existing internal window cills avoiding a complete replacement. A neat finish is achieved because the L-Shaped lip wraps around.. Thin internal Cover Cill 3mm x 245mm x 2.5m The L-Shaped lip Cill is an extremely versatile product suitable for use both inside and out. 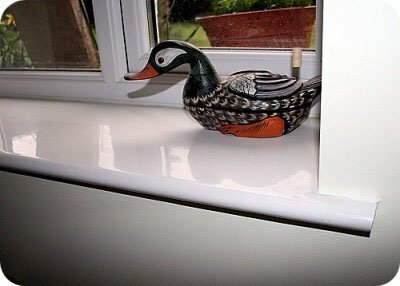 Use this board to cover existing internal window cills avoiding a complete replacement. A neat finish is achieved because the L-Shaped lip wraps around.. Description : 1.25m long 160mm overall size - covers 125mm - Comes with a pair of end caps ! Also known as Hockey Nose Cill or board, The Hockey Bull Nose Cill is an extremely versatile product suitable for use both inside and out. Use this board to cover existing internal window cill.. Description : 2.5m long 160mm overall size - covers 125mm Also known as Hockey Nose Cill or board, The Hockey Bull Nose Cill is an extremely versatile product suitable for use both inside and out. Use this board to cover existing internal window cills avoiding a complete replacement. .. Description : 5m long 160mm overall size covers 125mm Also known as Hockey Nose Cill or board, The Hockey Bull Nose Cill is an extremely versatile product suitable for use both inside and out. Use this board to cover existing internal window cills avoiding a complete replacement. A..
1.25m long 180mm overall size covers 145mm - Comes with a pair of end caps ! Also known as Hockey Nose Cill or board, The Hockey Bull Nose Cill is an extremely versatile product suitable for use both inside and out. Use this board to cover existing internal window cills avoiding a complete rep..
2.5m long 180mm overall size - covers 145mm Also known as Hockey Nose Cill or board, The Hockey Bull Nose Cill is an extremely versatile product suitable for use both inside and out. Use this board to cover existing internal window cills avoiding a complete replacement. A neat finish i..
5m long 180mm overall size - covers 145mm Also known as Hockey Nose Cill or board, The Hockey Bull Nose Cill is an extremely versatile product suitable for use both inside and out. Use this board to cover existing internal window cills avoiding a complete replacement. A neat finish is achie..
1.25m long 210mm overall size - covers 175mm - comes with a pair of end caps ! Also known as Hockey Nose Cill or board, The Hockey Bull Nose Cill is an extremely versatile product suitable for use both inside and out. Use this board to cover existing internal window cills avoiding a comp..
2.5m long 210mm overall size - covers 175mm Also known as Hockey Nose Cill or board, The Hockey Bull Nose Cill is an extremely versatile product suitable for use both inside and out. Use this board to cover existing internal window cills avoiding a complete replacement. A neat finish is ach..
5m long 210mm overall size - covers 175mm Also known as Hockey Nose Cill or board, The Hockey Bull Nose Cill is an extremely versatile product suitable for use both inside and out. Use this board to cover existing internal window cills avoiding a complete replacement. A neat finish is achie..
1.25m long 240mm overall size - covers 205mm - Comes with end caps ! Also known as Hockey Nose Cill or board, The Hockey Bull Nose Cill is an extremely versatile product suitable for use both inside and out. Use this board to cover existing internal window cills avoiding a complete replacement..
2.5m long 240mm overall size - covers 205mm Also known as Hockey Nose Cill or board, The Hockey Bull Nose Cill is an extremely versatile product suitable for use both inside and out. Use this board to cover existing internal window cills avoiding a complete replacement. A neat finish is ach..
5m long 240mm overall size - covers 205mm Also known as Hockey Nose Cill or board, The Hockey Bull Nose Cill is an extremely versatile product suitable for use both inside and out. Use this board to cover existing internal window cills avoiding a complete replacement. A neat finish is achie..
1.25m long 260mm overall size - covers 225mm - Comes with end caps ! Also known as Hockey Nose Cill or board, The Hockey Bull Nose Cill is an extremely versatile product suitable for use both inside and out. Use this board to cover existing internal window cills avoiding a complete repla..
2.5m long 260mm overall size - covers 225mm Also known as Hockey Nose Cill or board, The Hockey Bull Nose Cill is an extremely versatile product suitable for use both inside and out. Use this board to cover existing internal window cills avoiding a complete replacement. A neat finish ..
5m long 260mm overall size - covers 225mm Also known as Hockey Nose Cill or board, The Hockey Bull Nose Cill is an extremely versatile product suitable for use both inside and out. Use this board to cover existing internal window cills avoiding a complete replacement. A neat finish is achie..